It's time for another week of throwbacks! I recently decided to destash my overgrown collection and came across this pretty. No worries, I decided this one needed to stay! OPI DS holos are some of the best holos around up into this day. This one I remember snagging in a blog sale a few years ago. 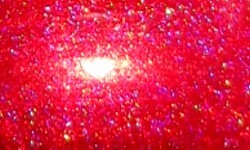 DS Ruby is a cherry red holographic. Color: This is a great red holo. This red leans more on lighter red side. I'd almost say it has the slightest hint of pink to it. The holo effect in this is more scattered than linear, but it still has a strong holo effect. You can see those rainbows! Formula: Excellent formula. I used 2 coats here. It applies beautifully. Price: You can sometimes still snag one of these on eBay in the $50 range. Overall: I love this red holo. It's a beautifully nostalgic blast from the past polish. The newer DS polishes definitely do not have this same diamond dust added to them as the older ones do. These older DS polishes are something special and I'm happy to have this one.